Vishay Thin Film offers a broad line of precision resistor networks in hermetic Flat-Packs for surface mount requirements in military, space or other harsh environmental applications. These networks provide the long-term stability necessary to insure continuous specification and performance over the 20 to 30 year life required for space applications. The fabrication of these devices is performed under tight procedural and environmental controls to insure conformance to all 883C Level H or K requirements. Custom configurations, values and tolerance combinations are available with fast turnaround. 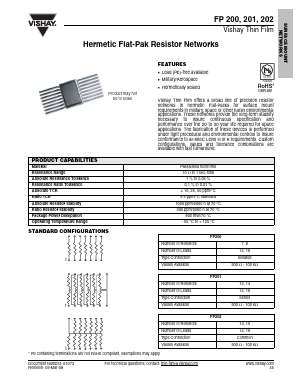 SW1N60C N-channel D-PAK/I-PAK/TO-92 MOSFET View Xian Semipower Electronic Technology Co., Ltd.
4N60B N-channel I-PAK/D-PAK/TO-220F MOSFET View Xian Semipower Electronic Technology Co., Ltd.